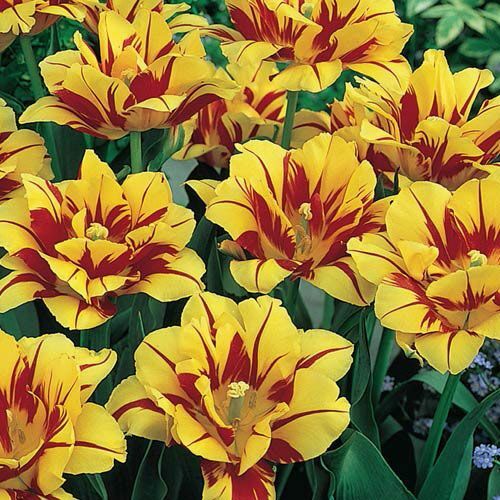 Add vibrant dashes of colour to your landscape with enchanting Monsella Tulips. These Dutch-sourced tulips feature a wealth of bright canary yellow petals. As they open their layers of petals into a flared trumpet shape, they reveal fiery streaks and licks of vivid red that contrast exuberantly with the sunny petal colour. These bowl shaped blooms closely resemble a peony or waterlily in shape and look remarkable in mid spring gardens. 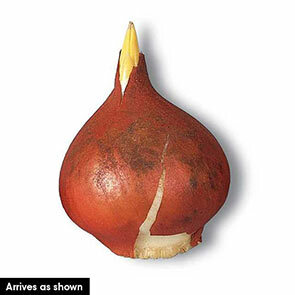 These tulips (Tulipa double early 'Monsella') do well in climate hardiness zones 3 to 8 and require full or partial sun. Plant the tulips in the fall to enjoy the lively blooms in mid spring. These perennial spring flower bulbs require well-drained soil, but they will also tolerate clay, loamy and sandy soil. For the best results, plant the multi-coloured tulips 6 inches deep and approximately 3 to 6 inches apart. Increase your curb appeal by planting your Monsella tulips along walkways, paths and borders, where they'll issue a clarion call for attention. Combine these tulips in flower beds with cosmos, peonies, hostas and coneflowers for a creative and dazzling arrangement. This type of magnificent Dutch tulip is wonderful for forcing indoors. Add it to your home as a seasonal houseplant or as cut flowers. Create a stunning spring garden with the impressive Monsella tulip. Garden impact is assured when these canary-yellow blooms open to show off their dark red painterly streaks to the fullest. 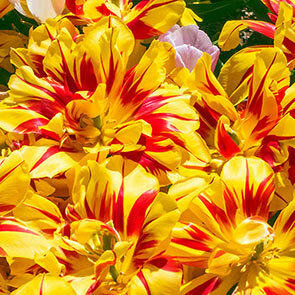 Each bulb produces about three striking blooms that measure up to an amazing 6" across. Long lasting in the garden or vase. They can even be forced indoors for an early breath of spring.